Have fun creating your Nomination modular bracelet. Choose the links you like the best and give life to a unique piece of jewellery. 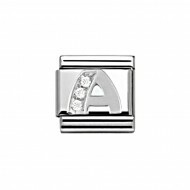 Composable Nomination Classic SilverShine Cubic Zirconia CZ Silver Letter A Charm. A perfect addition to your charm bracelet. Andrew Berry offers customers an expert edit of investment pieces and wardrobe staples. Shop from well known brands, including Hot Diamonds, Clogau Gold, Gecko, Nomination, Kit Heath, Accurist, Sekonda and be inspired by weekly style features and trend updates.